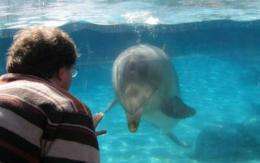 Do dolphins use nonlinear mathematics? Research from the University of Southampton, which examines how dolphins might process their sonar signals, could provide a new system for man-made sonar to detect targets, such as sea mines, in bubbly water. When hunting prey, dolphins have been observed to blow 'bubble nets' around schools of fish, which force the fish to cluster together, making them easier for the dolphins to pick off. However, such bubble nets would confound the best man-made sonar because the strong scattering by the bubbles generates 'clutter' in the sonar image, which cannot be distinguished from the true target. Taking a dolphin's sonar and characterising it from an engineering perspective, it is not superior to the best man-made sonar. Therefore, in blowing bubble nets, dolphins are either 'blinding' their echolocation sense when hunting or they have a facility absent in man-made sonar. The study by Professor Tim Leighton, from the University's Institute of Sound and Vibration Research (ISVR), and colleagues examined whether there is a way by which dolphins might process their sonar signals to distinguish between targets and clutter in bubbly water. In the study, published in Proceedings of the Royal Society A, Professor Leighton along with Professor Paul White and student Gim Hwa Chua used echolocation pulses of a type that dolphins emit, but processed them using nonlinear mathematics instead of the standard way of processing sonar returns. This Biased Pulse Summation Sonar (BiaPSS) reduced the effect of clutter by relying on the variation in click amplitude, such as that which occurs when a dolphin emits a sequence of clicks. Professor Leighton says: "We know that dolphins emit sequences of clicks and the amplitude of each click can vary from one to the next, so that not all the clicks are the same loudness. We asked, what if this variation in amplitude was not coincidental, but instead was key to distinguishing fish from bubbles. "These clicks were shown to identify targets when processed using nonlinear mathematics, raising the question of whether dolphins also benefit from such mathematics. The variation in amplitude of these clicks is the key: it produces changes in the echoes which can identify the target (fish) in the bubble net, where man-made sonar does not work. "Although this does not conclusively prove that dolphins do use such nonlinear processing, it demonstrates that humans can detect and classify targets in bubbly water using dolphin-like sonar pulses, raising intriguing possibilities for dolphin sonar when they make bubble nets." BiaPSS was shown to be effective in distinguishing targets from the clutter generated by bubbles in the 'field of view' of the sonar. One such target is a sea mine, which is relatively simple to purchase, and inexpensive (around $1,000 each) compared to the financial damage (let alone injury and loss of life) that they cause (for example $96 million repair to USS Samuel B Roberts; $24 million repair to USS Princeton; $3.6 million to USS Tripoli). Professor Leighton adds: "There are still questions to answer. For one thing, dolphins would have to use a frequency, when they enter bubbly water, which is sufficiently low that they can hear up to frequencies twice as high in pitch. Until measurements are taken of wild dolphin sonar as they hunt in bubbly water, these questions will remain unanswered. What we have shown is that it is not impossible to distinguish targets in bubbly water using the same sort of pulses that dolphins use." The authors previously proposed a form of sonar signal (TWIPS: Twin Inverted Pulse Sonar) that could work in bubble clouds, consisting of pairs of pulses that were identical except that one was inverted with respect to the other, that could detect targets in bubbly water if the signal processing were to make use of nonlinear mathematics. However, while these TWIPS pulses were successful, there was no conclusive evidence that the types of pulses devised for that study are used by any type of dolphin. The auditory mechanism of mammals includes a hardware (analog) frequency analyzer. Sounds are sorted spectroscopically *before* they are processed for audio direction finding. This permits instantaneous discrimination between high-frequency components (produced by bubbles) and lower frequency components due to fish. Right, dolphins use nonlinear mathematics just like every human uses fourier transforms... they just don't realize it, and couldn't do it consciously to save their lives. Telling the direction of a sound is way more subtle than mere comparing of time of arrival differences and intensity differences. These will only narrow down the sound inside a "conical shell". Non-linear, non-shminear... That's as smart as saying that the guy at the pub throwing darts is using second-degree polynomials to calculate the needed neural pulses to send to his muscles. I agree with wwqq. If we only used the sound arrival difference between the ears, we couldn't hear the difference between something in front or behind us. There's much more to hearing than that.